The MCP73841 combines high accuracy constant-voltage (0.5% max), constant-current regulation, cell preconditioning, cell temperature monitoring, advanced safety timers, automatic charge termination, and charge status indication in a space saving MSOP-10 package. The device provides a complete, fully functional, stand-alone charge management solution for applications utilizing single cell Lithium-Ion or Lithium-Polymer battery packs. Two preset voltage regulation options are available, 4.1V and 4.2V, for use with either coke or graphite anodes. 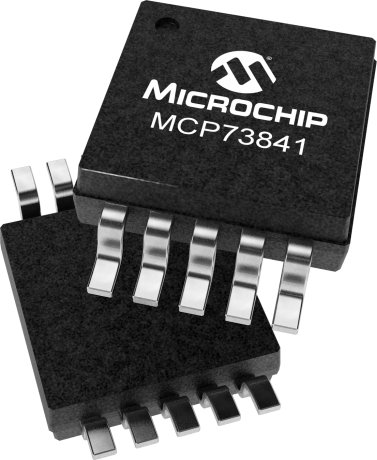 The MCP73841 operates with an input voltage range of 4.5V to 12V and is fully specified over the ambient temperature range of -40°C to +85°C.